It goes without saying that renewable energies have received a lot of attention recently. Particularly Europe has been eager to extend its production capacities of solar energy, wind etc. Although, on a European scale, renewables are still playing a smaller role, their contribution to the energy mix has constantly risen during the past decade. This growing impact is likely to continue thoughout the continent ove the years to come. Let us first have a glance at the situation of renewables in the EU-27. During the period 1998-2009 its production level has been up by 60.7%, contributing in 2009 some 148.4 Mtoe to the energy mix. Fig.1 shows the evolution of production figures for the respective period. 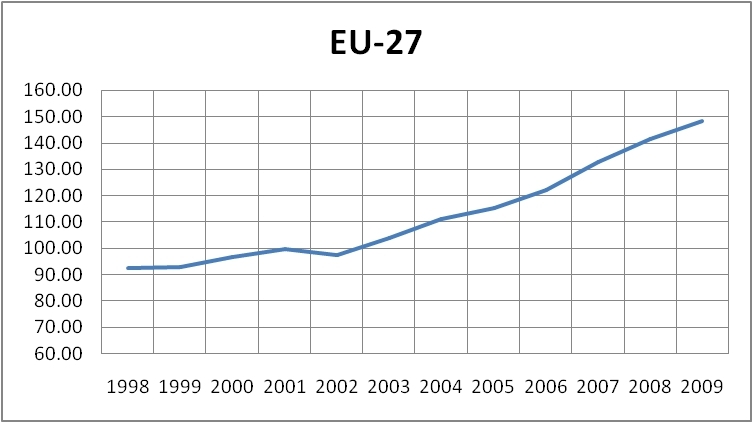 All raw data for this figures as well as for the following ones have been taken from Eurostat. 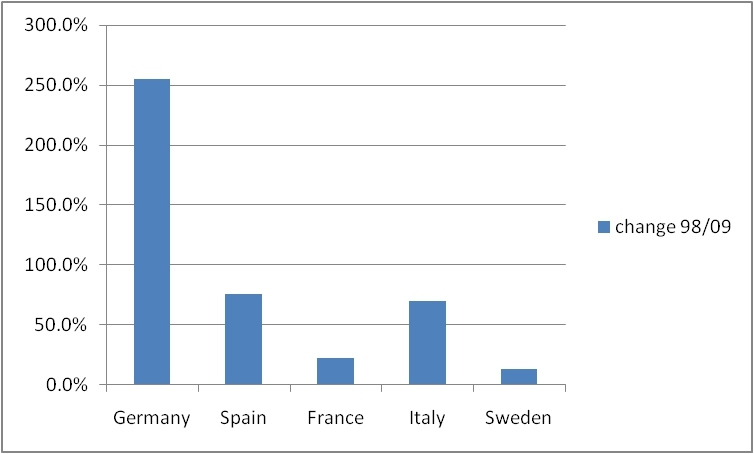 There is, of course, a huge variety among the EU Member States when it comes to producing energy from renewables. Political, economic and geographical factors come into play, determining the pace at which new sources might replace the conventional ones. Some countries have already a certain tradition of using renewables, mainly water, while others have been starting more or less from scratch. Fig. 2 provides us with an overview of the biggest producers of renewables in Europe. Only those countries were selected which in 2009 produced more than 10 Mtoe. The list comprises Germany, Spain, Italy, France and Sweden. Only two of them, France and Sweden, would have passed the selection criterion already in 1998. The eye-catching feature in this picture is Germany which starting from a relatively low level (7.8 Mtoe in 1998) managed to outgrow all the other big producers. In 2009, it produced some 27.7 Mtoe from renewables, an increase of 255%. However, this may be considered an intermediate step only, given that Germany recently decided to phase out its entire nuclear production capacity by 2022. It is very likely that a substantial part, if not all, of the nuclear output will be taken over by renewables. I have discussed this issue in one of my previous posts, Germany´s Energy Future. 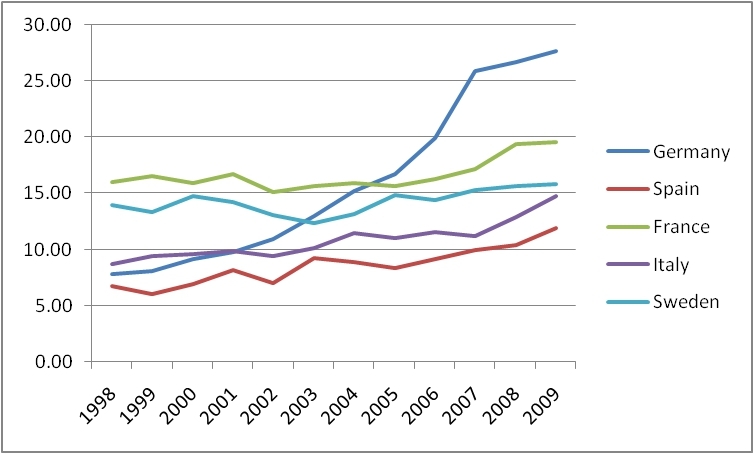 Finally, let us have a look at the growth rates in those countries which are demonstrated in Fig. 3. Germany is the clear champion which does not come as a surprise after having seen Fig. 2. Spain and Italy saw an increase of renewable production of 75.5% and 69.9%, respectively. These two countries performed better than the EU average. On the other hand, France and Sweden show less than average growth rates with 22.2% and 13.0%, respectively. Why is that so? France is the biggest producer of nuclear energy in Europe, generating some 75% of its electricity from nuclear power plants. Thus, unless France is closing down a substantial amount of its nuclear capacities, its potential for using renewables appears to be quite limited. The case of Sweden is slightly different. As can be seen from Fig. 2, it has always been a big player among the users of renewable energy with water being the main source. It appears that the potential for using hydroelectricity is largely exploited. Therefore Sweden must increase its usage of biomass etc. in order to see production from renewables going up.